Waynesboro, PA does not come to mind when you think of contributions to hip-hop, but Kimetrius “Lil Skies” Foose hopes to be that boundless rose to spring forth from the concrete. As a youth, Skies spent his time between Chambersburg and Waynesboro where his father – a local rhymer – planted seeds of rap success in the then toddler’s fertile mind. Not many people can definitively say they knew their purpose before kindergarten, but Lil Skies is not your ordinary 19-year-old. While some saw an unassuming, skating stoner, saturated in tattoos – a fixture in forgotten small-towns across America – beneath the surface laid a sharp and perceptive mind that gravitated towards punchy lyrics masked by melodic delivery like those of 50 Cent and Lil Wayne. “I look at my body as an extension of the music. My body is a canvas and with my tattoos, I want them to be a direct reflection of my thoughts. I have ‘cold heart’ written in Chinese backward under my eye and people ask about it all the time,” Skies described of his latest ink—a nod to his lyrics, which serves as a reminder and a warning to remain genuine. Skies would channel the dichotomous lessons he learned from his father’s aspirations to make a way and his mother’s determination to provide for her family into his studies and rhyming. A straight-A student in high school, Skies enrolled at Shippensburg University, where he continued to work on music between schoolwork. While he was the people’s champ in high school, it was the students of Shippensburg who immediately and fervently took to his music, eventually leading to an opportunity to open for Fetty Wap at a 2016 university-sponsored concert. The draw of that moment was too much to ignore, and within a few months, Skies would drop not only out of his school, but two buzzing mixtapes – Good Grades Bad Habits and Alone – via Soundcloud. “I always knew I was going to drop out of college. I was an excellent student, but the experiences there were to help my music,” Skies explains. “It was a necessary step in my life to get the music out there.” The friends, fans, and resources he soaked up in that short time would come in handy for Skies when his breakout song with friend and collaborator Landon Cube “Red Roses” started to gain speed. Over a woozy and sparsely-produced track by Menoh Beats, the pair emotively meanders through tales of their vices, women, trust issues, and goals. “Red Roses” was streamed over 3M times when it dropped in July and coolly received another million in the first week of the long-awaited visual’s release helmed by Chicago director and new-rap impresario Cole Bennett of Lyrical Lemonade. The devil is in the details as Skies readies his forthcoming “dark and lit” mixtape Life of a Dark Rose. His next single, “Signs of Jealousy” continues his sing-song cadence powered by a distinct flow and etched with his pragmatic and relatable musings. 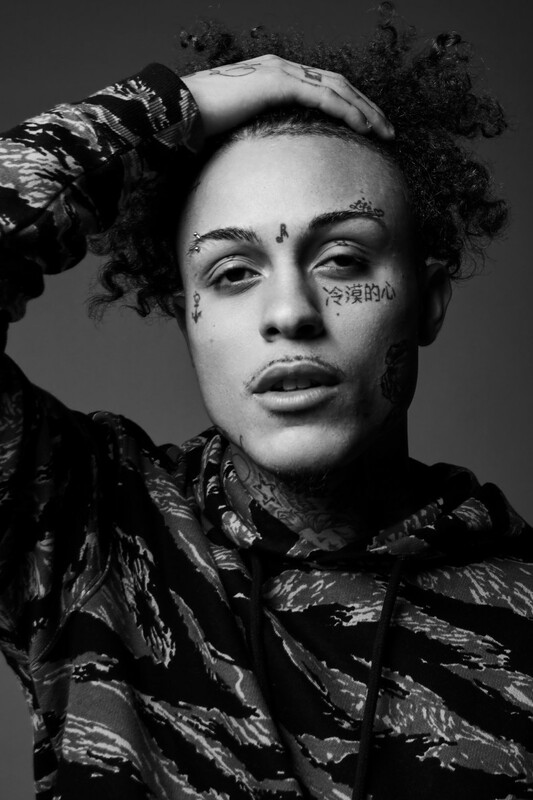 “I can’t wait for people to hear the new music, get acquainted, and see what Lil Skies is really on.” For Skies, despite the thorns and harsh terrain, there is no limit or ceiling that blood cannot break.